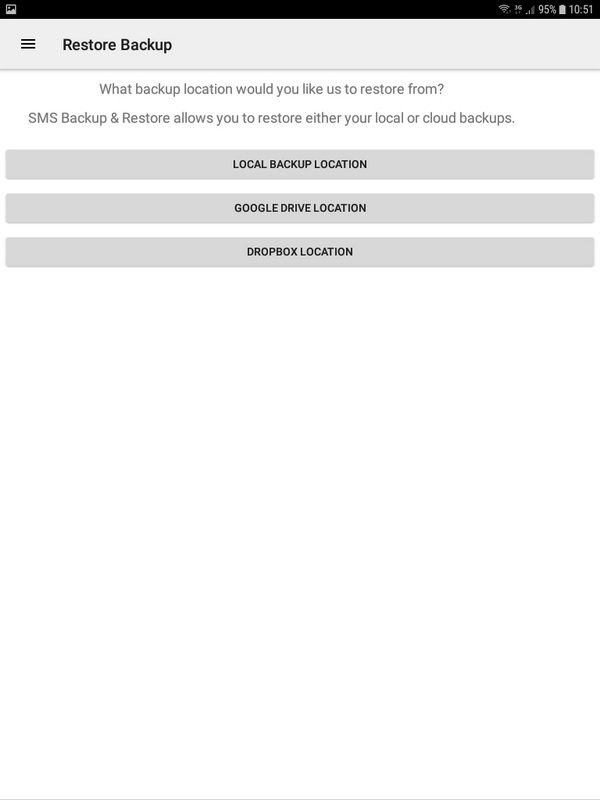 SMS Backup & Restore has all the features you want from a Backup and Restore SMS application. Among the various Android app to try the same type, it is in my opinion the best choice both in terms of functionality and ease of use. The only flaw that can be found is on the transfer from one device to another, as it is not present on other systems other than Android, but in my opinion this lack does not make him lose the fifth star. 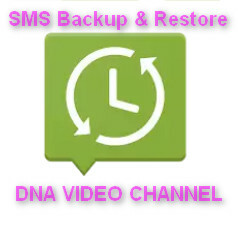 SMS Backup and Restore (SMS Backup & Restore to be precise), is an application for saving, copying, and restoring SMS. As often happens, i write this article because i came across this need just the other day. I had to copy the SMS from one phone to another to avoid losing their content. As usual, on internet i found several articles, but none of them really helped me to choose the app that did it for me. I tried three of them, one of which was completely useless, another that in the absence of others could pass but not really usable, and finally SMS Backup and Restore that fully satisfied me. 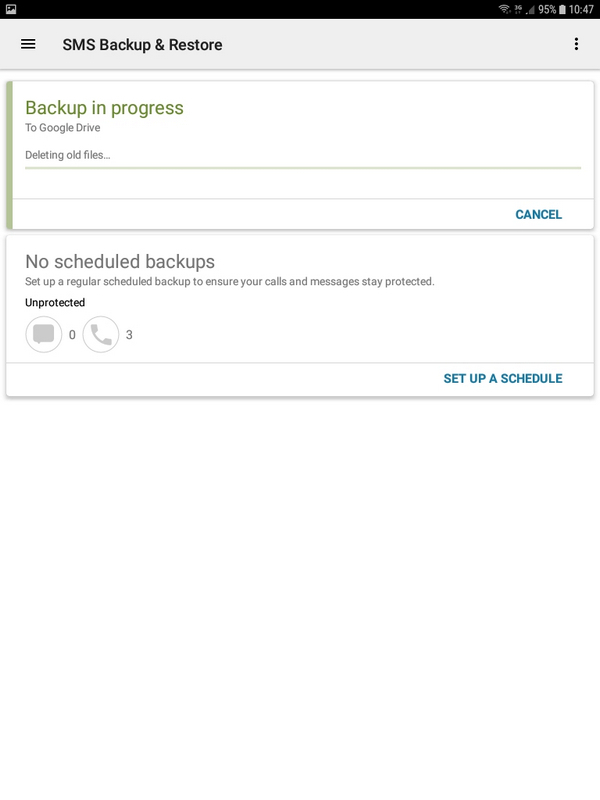 SMS Backup and Restore gives you the ability to back up your SMS, keep it on your SD card and your Cloud space, and finally read or even restore the stored SMS on same or other devices. Let’s see them work together. 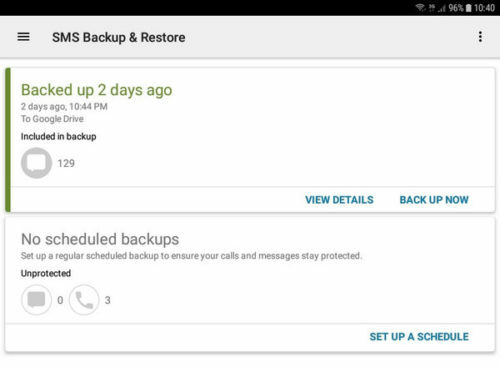 SMS Backup and Restore just started will show you the previous backups you have made earlier. 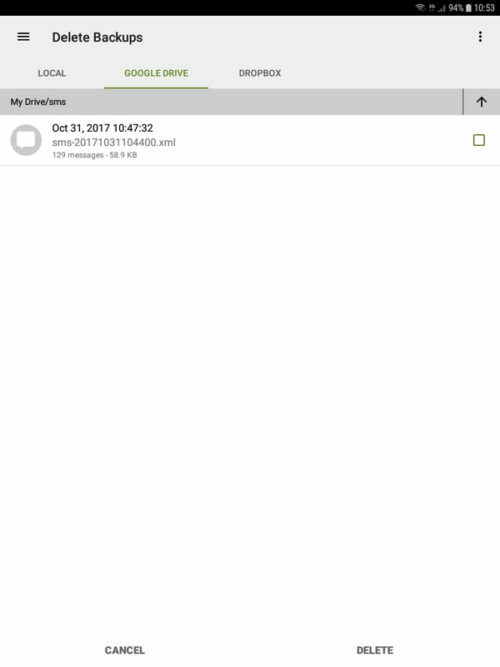 In my case, as you can see in the figure, i made a backup of my SMS two days ago. 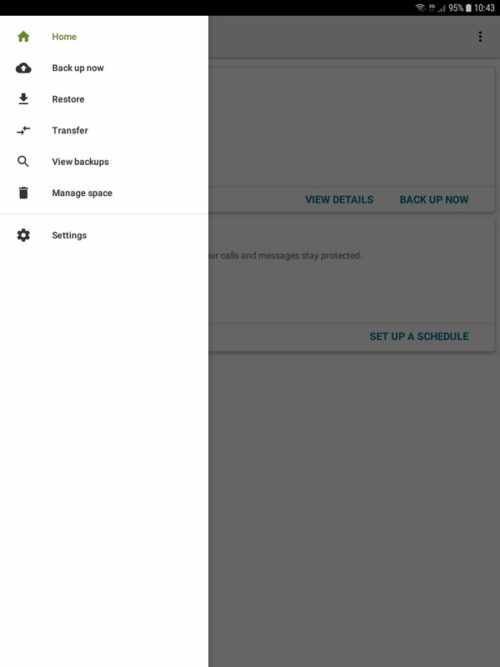 By selecting the menu in the upper left (indicated by the icon usual three lines), you will see all the options that SMS Backup and Restore makes available to you. We select the menu item to create a backup. On the next screen you can set some parameters for configuration of the same. Specifically, we can set the name to be backed up, for those who decide to keep it different, i suggest giving it a meaningful name. 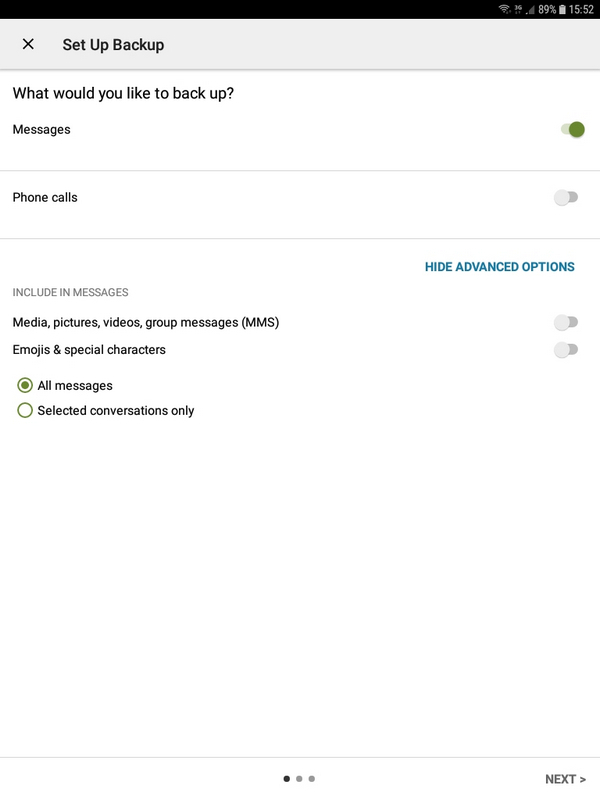 In addition to messages you can also activate the backup of the incoming and outgoing calls, i did not need it, but it is not said to be so for you as well. 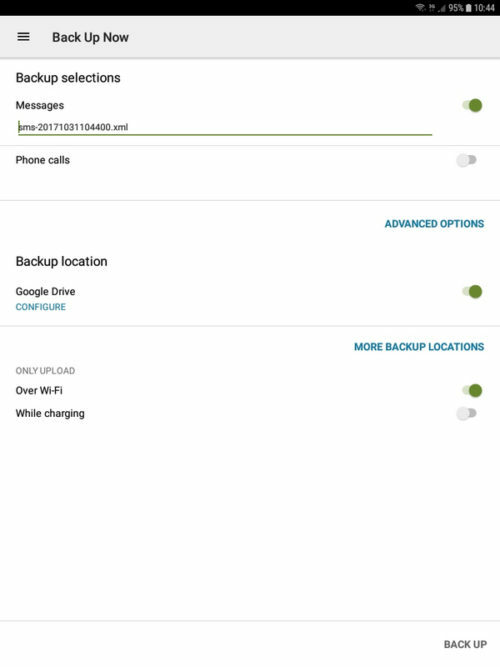 However, the most important option in this screen is the backup location setting. If you have not previously configured a Cloud account as Google Drive or Dropbox, saving your backups will be made only on your device. I advise you to save it on an external drive, or SD Cloud least, although in the latter case, if you lose your phone or worse, someone steal it, you can do with very little. 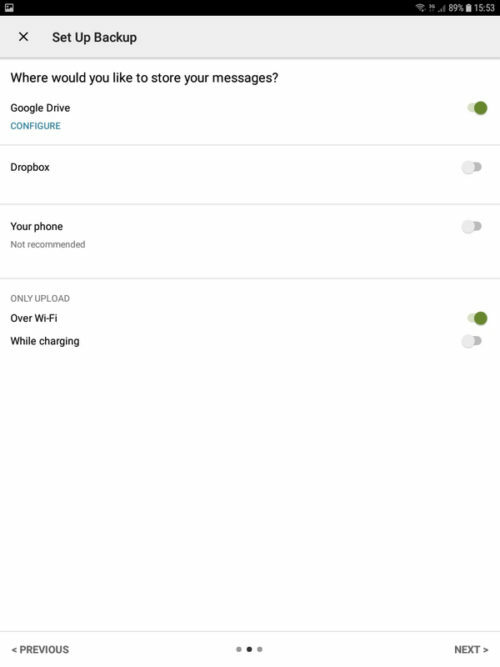 If you choose to enable remote backup on Google Drive (DropBox is configured in the same way), you will usually need to provide your access parameters. Usually the backup will be created within the SMS folder on Cloud. If you prefer, you can change it any time and indicate the desired path. 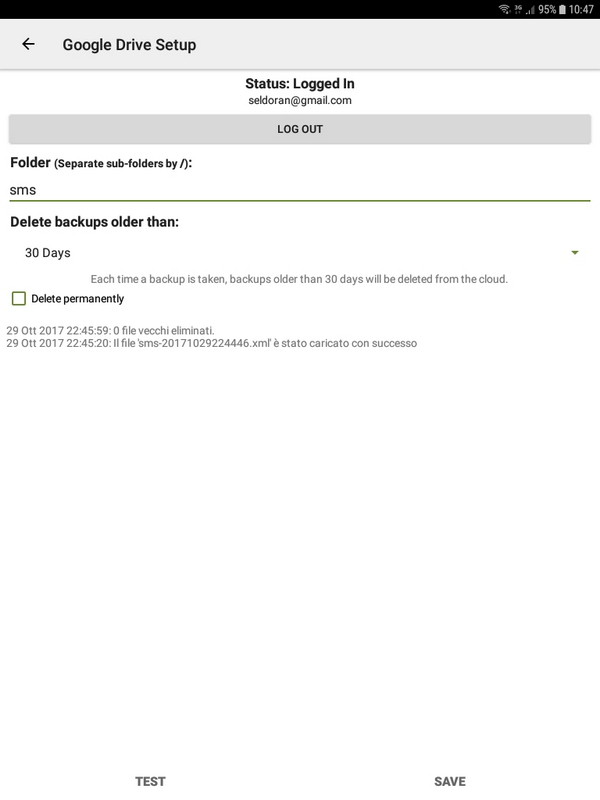 After starting the backup creation, our saving will be created, if you have selected the Cloud, it will also be performed the upload. Starting with the 4.4 version of Android, you need to set SMS Backup and Restore as the default application for managing messages (usually Hangout). 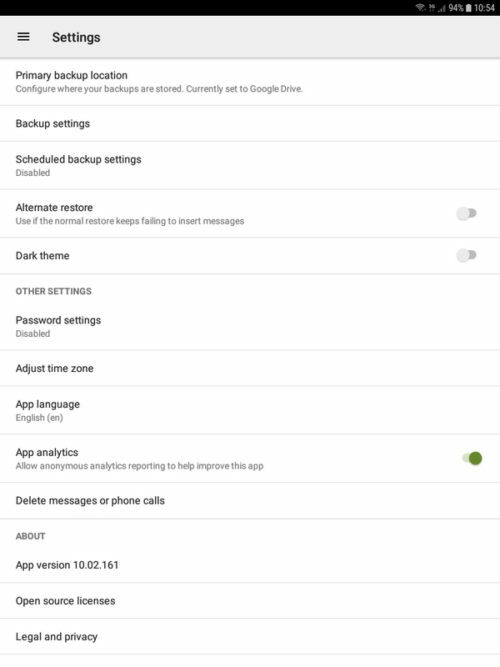 It’s nothing particularly complex, just say yes when the application asks you to make the SMS Backup and Restore the default application. At the end of the process, you will be asked if you want to restore your previous application as a default. 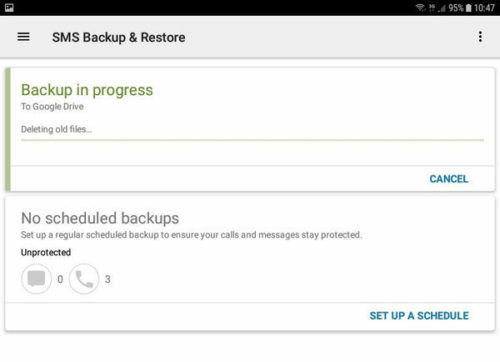 SMS Backup and Restore as well as back up when you decide to do, it gives you the opportunity to plan their creation. First, we choose what we have to save. I avoid Emojiis and select special characters to avoid compatibility problems with other applications. 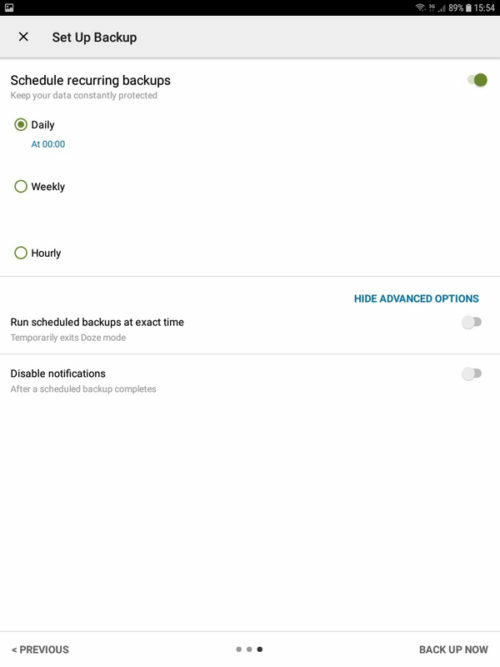 Continuing, the next setup screen, we can choose the different store where we want to store the backup. As I suggested earlier, my advice is not to keep the rescue only on your device, but also save them on Google Drive and / or Dropbox. In the last step we set of configuration parameters for scheduling the daily, weekly, etc. To proceed and set the schedule, select the button at the bottom right “back up now”. The third menu item allows us to access the section for restoring a previous backup. 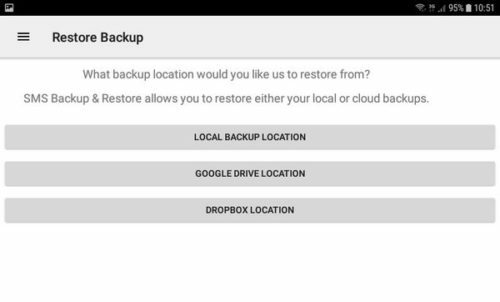 We can restore from one of the locations shown in the figure, local, Google Drive or Dropbox. After choosing the location, we will have to choose the backup file you want and resume it. If you like me, your purpose is to copy SMS from one cell to another, direct transfer is the functionality that you need. 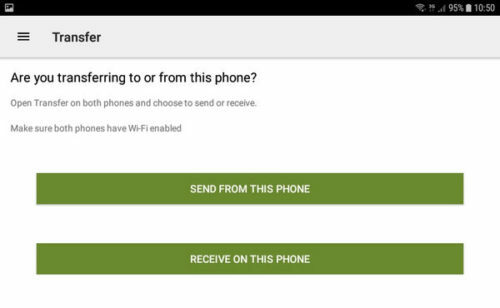 To copy SMS from one device to another, you must first install and start the application on both devices. The device from which to copy the SMS should send them by selecting the first entry of the previous figure. Instead, the receiving device will have to wait for the messages to be sent. To do so, you must select the second item. 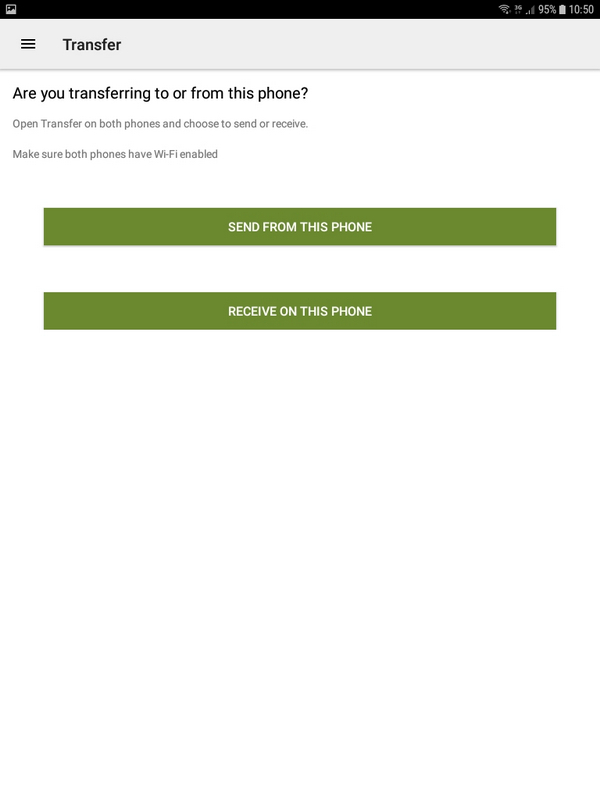 When you have completed the procedure, the copy will be started and your SMS will be on the receiving device. Through the viewing feature, we can access the previously created backups. Selecting one of the previous saves, you can view its contents without restoring them. 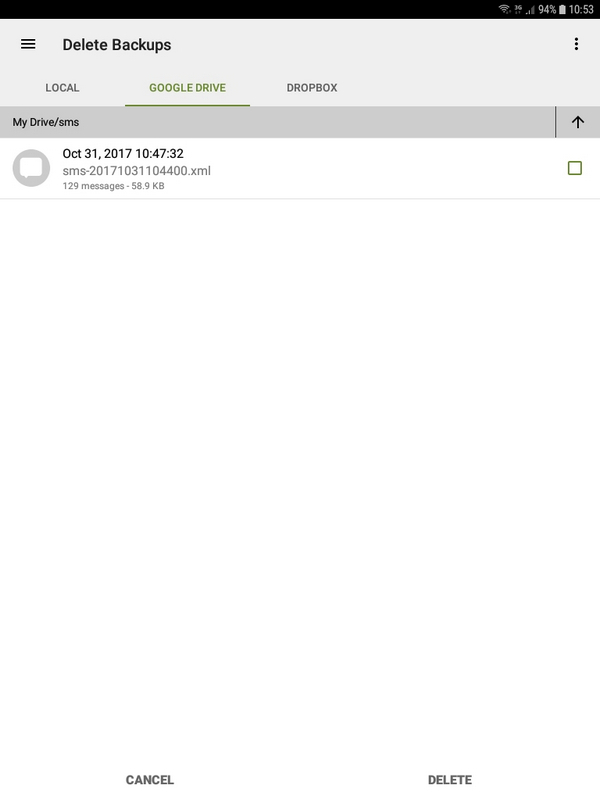 Very useful for quickly accessing and viewing messages in the selected backup. Very useful feature, especially if you choose to create your backups with an automatic scheduling. You can navigate between the different types of storage that you have configured in the application. Select the files to delete and proceed with their elimination using the button at the bottom right “Delete”. By accessing the settings of the app, you can configure various aspects of the app. Language, any security passwords, the main location of saves and much more. If there is no particular need, such as setting a security password or main location, you can also leave the default options. SMS Backup and Restore is a great application for managing your SMS. Recommended for those who cares their received messages and want to keep them carefully and take them from his old Android phone to the new just bought. How many lovers still keep the SMS exchanged with his/her partner? With the advent of WhatsApp, surely this need has decreased, but still SMS have their “followers”, especially those who maintain these SMS for a long time (see my wife that keeps them carefully from the engagement time). As always, if the article liked you, share it with your friends and sign up for my pages and on my YouTube channel.